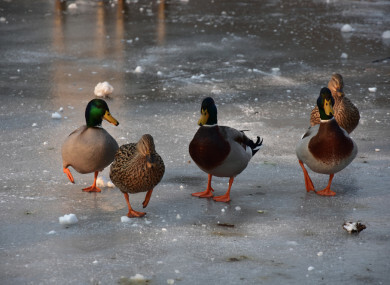 There are five ducks in this photo - but how many knees can you see? 1. #COLLEGE ROAD: The body of a man in his 20s was found at Galway’s City Hall. 2. #BREXIT: Taoiseach Leo Varadkar says a deal might not be reached until December, and the EU wants a backstop to the backstop – but Theresa May won’t accept it. 3. #GERMANY: Police said that they have subdued and detained a man who took a woman hostage in a pharmacy in Cologne’s central train station. 4. #ARAS 18: Sinn Féin has closed down a members WhatsApp group after messages sent to it described Michael D Higgins as a “leprechaun”. 5. #JAMAL KHASHOGGI: US President Donald Trump has said that he’s sending Secretary of State Mike Pompeo to Saudi Arabia to discuss the disappearance of a Washington Post columnist after visiting the Saudi consulate in Istanbul.